afrol News, 8 December - In and around the giant Lossi Sanctuary in north-western Congo Brazzaville, thousands of great apes are dying at rapid speed. Researchers hold they have finally found proof that Ebola is killing large numbers of gorillas and chimpanzees, but were unhappy to note the scale of deaths, which could threaten the entire population of gorillas. 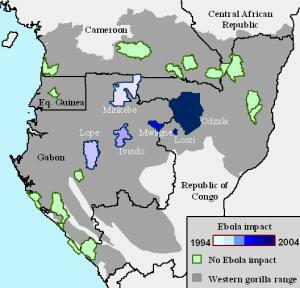 Since reports of ape die-offs first circulated widely in 2003, sceptics have doubted how large these die-offs were and whether Ebola was even the cause. The new study, led by Magdalena Bermejo of the University of Barcelona, allays these doubts because it was conducted in a closely monitored gorilla population where genetic tests confirmed Ebola as the cause of death. Ms Bermejo and colleagues from the Max Planck Institute for Evolutionary Anthropology and Uppsala University first showed that 93 percent - or 221 of 238 - individually known gorillas at the Lossi Sanctuary in northwest Congo Brazzaville were killed by Ebola during outbreaks in 2002 and 2003. They then used transect surveys to show that 95 percent gorilla mortality rates extended over a much larger area of several thousand square kilometres. Chimpanzees were also heavily affected, with a mortality rate of 77 percent. Lossi was just one in a series of large gorilla and chimpanzee die-offs caused by Ebola over the last twelve years, according to the researchers. Accurate figures on exactly how many apes have died are not yet available. But given the large amount of prime habitat affected, these Ebola outbreaks may have killed as much as 25 percent of the world gorilla population. Particularly troubling has been the concentration of Ebola impact on large, remote protected areas that were designed to be the bulwarks of ape conservation efforts. Ebola has not totally made apes totally extinct from these areas but it has pushed once huge populations down to smaller sizes at which they are dramatically less resilient to illegal hunting and other looming threats. Just as troubling were recent studies showing that the Ebola infection wave was spreading rapidly towards several of the remaining large protected areas in the region. Results from the new study suggest that protecting these remaining ape populations from Ebola may be much more feasible than previously appreciated. At Lossi, most gorillas appeared not to be infected directly from some reservoir host, as previously assumed. Rather, initial spill-over from a reservoir host appeared to trigger an epidemic that spread from gorilla social group to gorilla social group. According to the scientists, this again "opens the door to targeted vaccination strategies" that, by breaking the chain of transmission, could be much more efficient than in the case of outbreaks driven entirely by reservoir spill-over. The consistent spread rate of the Ebola infection wave also had suggested that vaccination could be targeted just ahead of the advancing wave. The current lack of a vaccination program is not due to a lack of vaccine options, as several different vaccines have now protected laboratory monkeys from Ebola and major vaccine labs are anxious to help. Rather, "uncertainty about whether a large Ebola control effort was necessary or even possible has paralyzed large donors and major conservation organizations," said Peter Walsh, a co-author from the German Max Planck Institute. "We are hoping that the starkness of our results will push some public or private donor to finally commit the two or three million dollars necessary to develop a safe and effective way of delivering Ebola vaccine to wild apes," Mr Walsh added. Mr Walsh contends that Ebola vaccination is a cost effective method of ape conservation. "People in the conservation community are intimidated by the up-front costs of vaccination and would prefer to instead spend the money on anti-poaching. What they are not factoring in is the fact that one year of Ebola vaccination could save as many apes as decades of anti-poaching. We need to do both," he concludes. Mr Walsh also points out that Ebola has the potential to quickly destroy years of ecotourism investment. For example, Bermejo's gorilla habituation programme at Lossi was set up in the mid-1990's in collaboration with the European Union's Ecosystem Forestiere d'Afrique Centrale (ECOFAC) project to bring ecotourism revenue to local people. Ebola not only wiped out the habituated gorillas at Lossi, it also neutralised years of ecotourism investment in neighbouring Odzala National Park by devastating gorilla populations there. "We are in a period where relatively modest investments in both Ebola control and anti-poaching would go a very long way towards insuring the future of our closest relatives," said Mr Walsh. "Let's not blow it." Further, Ebola outbreaks among great apes are seen by many scientists as the root for later Ebola outbreaks among human societies, which occur on a regular basis in Congo Brazzaville and neighbouring Gabon and cost hundreds of human lives. Targeted immunisation of apes could be a way of halting these outbreaks among human populations as long as no Ebola vaccine for humans yet has been approved of.